India will soon get a seat on the Global Foreign Exchange Committee (GFXC) a newly created forum of central bankers and experts to work for promoting a powerful and transparent Foreign Exchange market. In a report on reducing misconduct risks in the financial sector, presented by the Financial Stability Board (FSB), an international body for global financial system at the G20 summit attended by the Prime Minister Narendra Modi, in Hamburg, Germany that actions to enhance conduct standard and adherence in market include a Global Code of Conduct for the Foreign Exchange Markets. The Global Foreign Exchange Committee has been set up under the guidance of the Bank for International Settlements (BIS). The new GFXC will maintain and update this code which also comprising public sector and private sector representative from the Foreign Exchange Committee of 16 International Foreign Exchange Trading Centres. In May 2017, the committee was set up in London during a meeting of Public and Private sector representative from the Foreign Exchange Committees (FXCs) of 16 international Forex Trading Centres. 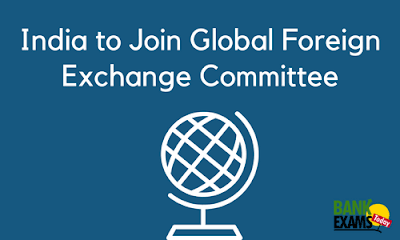 The newly expanded and formalized GFXC replaces similar but more informal originations of eight foreign exchange committees (FXCs) from Australia, Hong Kong, Singapore, Japan, Euro Area, Canada, US and UK. The committee will now include a representative from existing, or soon to be established, foreign exchange committees or similar structures in India, Brazil, Mexico, China, Korea, South Africa, Switzerland and Sweden. It will explore by communicating and developing collaboration among the local Foreign Exchange Committees and Non – GFXC jurisdictions with significant Forex Markets. It is an international financial organization, which promotes international monetary and financial cooperation also serves as a bank for central banks. The headquarter of BIS is situated in Basel, Switzerland.